‘Coyote’s Caravan’ was an attempt to fix a problem we’ve had for several years. The only organic Russian Caravan tea we had access to is sometimes problematic to keep in stock. The supplier is always very apologetic when they are out and we have to wait, and they always try to make up for the lack – but it is still somewhat maddening to have to delay orders because I cannot get my hands on the right tea. It probably took a bit too long for me to realize that I had the skills to blend our OWN version of Russian Caravan. In the end it is just a blend of a certain selection of black teas, and blending different sorts of tea together has been a diverting fixation for much of this year. Once the lightbulb finally turned on (I figure there was a loose connection in there somewhere, probably due to the fact that I still find combining different types of tea to be mildly intimidating) – it was time to look into what, exactly, qualified as Russian Caravan tea. My initial research presented me with a problem. We had access to the Lapsang from our wonderful local supplier, but the only organic Keemun I had been able to find came from the same supplier as the Russian Caravan… and that seemed like trading out one problem for another, near exactly the same, problem. However, on one of our restock runs to that local supplier, I lamented about the circumstance, and about how I wished that they had an organic Keemun. The elation was intense. I didn’t quite dance with glee, because there is always a chance Raubahn will join me in such positive physical expressions, and while he would not have been a Bull in a China Shop, a Great Dane in a Tea Shop would probably be comparable, were he in “Excite! I don’t know what my Tail is doing but there are Crashing Sounds! Which is Also Exciting!” mode. We added some of their Keemun to our purchases – making sure to have Enough for Appropriate Testing of Things, along with a couple of tiny “I am curious about these” samples… and I wondered what I was going to do about the other part of the problem. Initial research had indicated Keemun, Lapsang, and Oolong. Which you would think would have been fine, as we have an oolong that we use, we’d just acquired Lapsang, and now we had Keemun from our preferred source. The issue was the size of the leaves of the Oolong. Even with the Dragon teas we’ve made with it, I have been tempted to break them up a little, to improve the consistency of the mix. But I’ve also felt reticent to do so. However, without some sort of manipulation of their size and shape, there was not going to be a way to blend the three teas together to get a consistent taste. So I dove back into research mode, figuring there HAD to be another option. And it just happened to be another tea that I had picked up for testing, on the recommendation of one of the stalwarts of #365teas. I’d really enjoyed the test cups of it, but had been vacillating on whether or not it should become an ingredient. I worry, sometimes, about having too many options for black teas to blend with, for a number of different reasons. Not the least of which being the gentle teasing from our local tea dealer about how most people cannot taste the more subtle differences between certain black teas. This is actually one of the reasons Mister Tea taste tests everything as well, and local friends get dragged into the process, too. I need to have more tastebuds than just mine experience things, since mine are apparently yet another mutation. One I am glad to have, but still…. I was actually pretty giddy about having a reason to play with it. It took a couple tests to put together the right balance for “our” Russian Caravan, but I was exceedingly happy with it once done. So was Mister Tea. It was so good, and still very much a Russian Caravan, but it was also much richer and deeper than the one currently in the toolbox. I was pretty sure we wouldn’t be able to use it to replace the current, due to the difference in taste. To make absolutely sure, I blended up a batch of our “Baker Street Blend” using this tea. It was glorious. It was a keeper. It also wasn’t Baker Street. It was different enough that it would need its own name. So said the tastebuds of both myself and Mister Tea. It also didn’t fit the other goal, which had been to maybe find a slightly less expensive version of Russian Caravan – we have a constant hope that we can keep our quality standards while finding ways to drop our price points. It irritates me that we could not afford our products if we did not get them at cost. Mostly because it means that there are people who cannot afford to experience what we do. I went back to the drawing board, as far as blending a replacement Russian Caravan. Delving back into things I realized I had made a critical error in my approach. I had researched Russian Caravan historically and generally. I hadn’t actually looked into the details of the one we had been using. It only uses two teas. I am sure you can imagine my chagrin at this discovery. Mister Tea and I discussed it, and we decided we were going to keep this particular blend, and maybe occasionally use it as the foundation for other teas… and the quest for a replacement basic Russian Caravan would continue. The name was fairly easy, given the way his face lit up when he experienced the test cup of this blend. 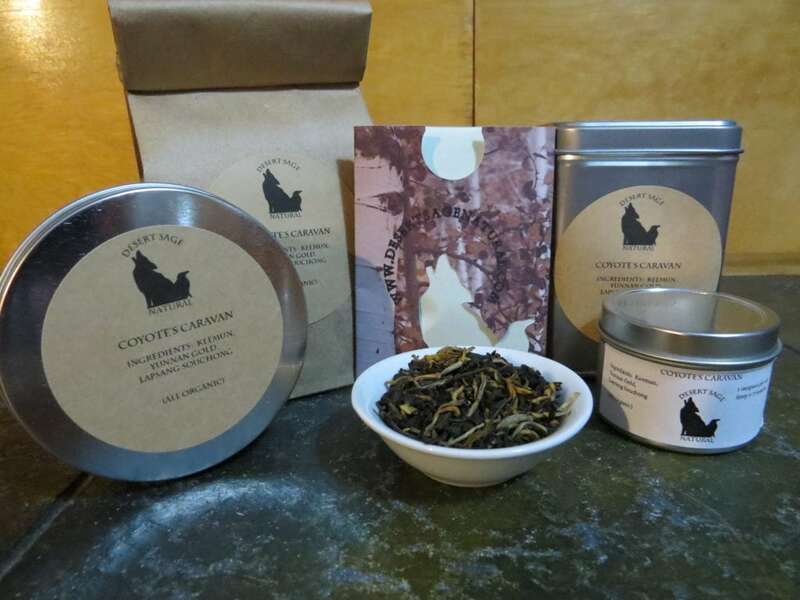 While we are willing to make decaffeinated versions of any of the teas where it is possible, ‘Coyote’s Caravan’ is unfortunately not one of the ones we would be able to manage. 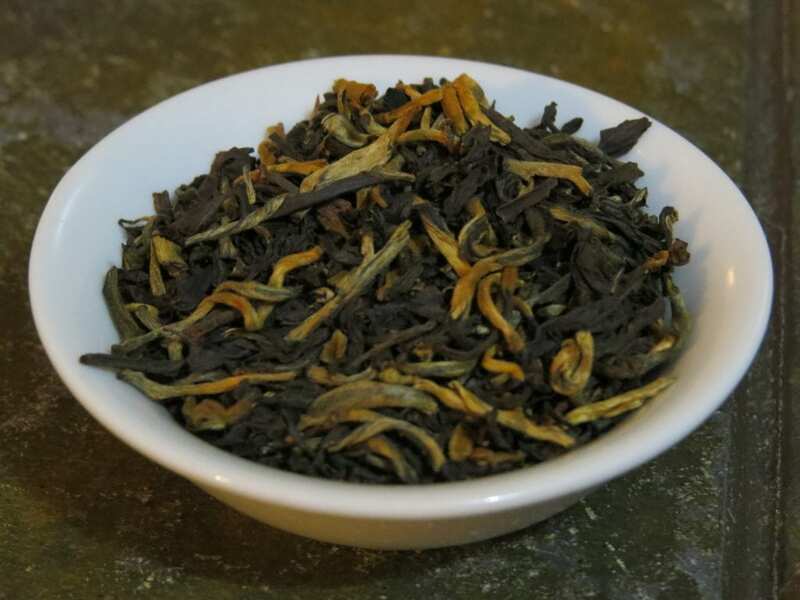 This entry was posted in Black Tea, Simply Tasty Teas, Smoky, Things We make (Tea, Coffee, Cocoa) and tagged Black Tea, Organic Golden Yunnan, Organic Keemun Black Tea, Organic Lapsang Souchong, Organic Smoky Tea, posts with audio, Smoky Tea by DesertSage. Bookmark the permalink. What an enjoyable story for a chilly morning.